Financial aid for nontraditional students is worth a shot. It’s better than gold, especially if it’s a grant, because you don’t have to pay it back. What’s there not to like? The Federal Pell Grant is based on financial need. The amount dispersed to each student is dependant on expectant family income, tuition cost, and whether you are a full- or part-time student. To determine your eligibility, you must fill out a Free Application for Federal Student Aid (FAFSA). This form’s due date is different for each state. For example, it’s due May 1 each year in New York. The catch, you must not have already received a bachelor’s degree or plan to attend school for more than five years, in the case of some majors. Then again, if you’ve already gotten a college degree, you wouldn’t be reading this; now would you? Gather up your income tax returns, bank statements, investment papers, retirement plan information and the kitchen sink. Also, to be eligible, you need to have a high-school diploma or GED; get satisfactory grades (no F’s please); no previous student loan defaults; and is a U.S. citizen. Scholarships are also available for mature students with almost all majors and hobbies, from chemistry majors to hand-knitting hobbyists. Scholarship information can be found on your chosen school’s Web site or you can find college scholarships here. “You’re a finalist,” in a contest you’ve never entered. “I just need your credit card or bank account number to hold this scholarship.” Right. Most people know by now not to give credit card or banking information over the phone to a person, particularly a stranger, who doesn’t need it. Still, thousands of people get taken for a ride to what they believe is a chocolate factory offering free goodies. You shouldn’t have to pay money to get free money. Money should flow to the student (okay then, to the colleges as well). Still haven’t found any money for college? Your employer may come to the rescue with a tuition assistance program. Why wouldn’t they? They want smart employees. They can award you up to $5,250, tax-free, though some employers will require that you maintain a minimum GPA or the degree of your choice must be work-related. For example, suppose you’re a retail store clerk, majoring in art history will not get you a raise at the end of the year. But if you’re a retail salesperson, majoring in retail management will surely make your current manager spike your coffee with alcoholic offerings to tarnish your credibility. 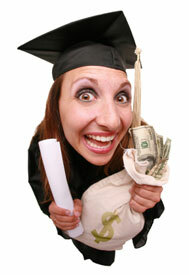 Check with your employer’s human resources department for their policy on employee sponsored money for college. If you’re a veteran of the United States armed forces, you may qualify for the Montgomery GI Bill. Spouses may also be eligible for benefits via the DEA (Dependant Educational Assistance). VA benefits are not currently taxable income, but I’m sure the IRS is working on a way to garnish this subsidy. Veterans may also receive credit for courses acquired within the military. And then there’s always the option to test out of various courses via CLEP exams. Some colleges are more receptive to accepting military credits than others. A CUNY school, Brooklyn College, assured me that they were very generous about accepting military credits. See your chosen college’s, veterans affairs’ office and bring your military paperwork, stating as to your discharge. You can find more about the GI Bill at their Web site at http://www.gibill.va.gov/.